This chapter examines, by means of a case study, a Canadian business school, including the evolution of its way of admitting students and facilitating the placement of graduates. Three forces triggered its evolution: the privatization of its programs within a publicly funded university, the emergence of globalization, and the increasing importance of business school rankings that directly affect applicants' selection of schools. The chapter demonstrates how the admissions process and program design are a work in progress, especially given new competitors internationally. It also shows how the reputation of the school is enhanced by the quality of its alumni. Ideally, to accomplish the school's goal of high quality education, the admissions process should mirror the strategy and positioning of the school. The Ivey School of Business numbers approximately 28,000 graduates, beginning with the introduction of the Honours Bachelor of Arts in 1923. Graduate programs include the MBA (introduced in 1948), the Doctor of Philosophy (PhD) (1961), the EMBA (1991), and the MSc (2010). Ivey has more alumni represented in C-Suite and executive positions than any other Canadian business school (of Ivey’s active alumni, one in two holds senior management positions), and Ivey alumni represent 106 countries (Ivey Alumni Network Fact Sheet, 2018). This chapter focuses on admissions practices and related programmatic changes with respect to its masters’ programs only. The authors discuss the change processes, challenges, and opportunities that the new funding model raised. The changes represent a work in progress because the market for graduate business education is radically shifting. The current environment is characterized by new competitors, both local and global, as well as new modes of learning, for example, the disrupters one finds in massive online open courses largely driven by higher fees for postsecondary education and the internationalization of both suppliers and participants. The changes in postsecondary education resulting from the disruption are well documented in Craig (2015), who suggests an unbundling of higher education, and, as a result, major disruptions with direct impact on existing institutions. As a result of these changes, admissions processes are evolutionary rather than revolutionary, and change is continuous. Change in a shifting environment that has multiple players who wish, often fiercely, to protect the status quo means that objectives for change are a moving target. Craig (2015) describes the preservation of the status quo as a governance problem. As a result of systemic inertia, one change based upon clear objectives and clear evidence of a problem, accompanied by information, forces other changes due to both foreseeable and often unforeseeable consequences. Leadership, transparency, and building support throughout the process are essential. The theme of faculty resistance to change is highlighted in other sources, for example, in Datar, Garvin, and Cullen (2010) and Moldoveanu and Martin (2008). 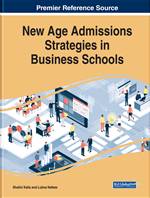 This chapter breaks new ground by examining in depth the changes necessary for admissions processes to address the challenges of a business environment in constant flux.